Pelican BioThermal is a global leader in providing the life sciences industry with the most comprehensive suite of patented and award winning thermal protection packaging solutions for the safe transport of pharmaceuticals, clinical trials, diagnostics, tissue, vaccines and blood supplies. We provide the life science industry with the broadest range of passive single-use and reusable temperature controlled patented packaging solutions for the safe distribution of frozen, refrigerated and controlled ambient temperature-sensitive payloads in profiles ranging from -50°C to 25°C and payload capacities ranging from 2 to 96 liters. Our specialized design, engineering and lab testing services ensure clients are fitted with cold chain performance solutions that best fit their purpose. And Pelican BioThermal’s Crēdo ProEnvision™ track-and-trace software, which allows clients to monitor temperature controlled packaging inventories throughout the entire end-to-end distribution cycle, ensures clients meet increasing global regulatory demands, manage challenging shipping lanes and unforeseen delays while reliably and confidently tracking critical, high-value payloads around the world. Combat-portable Golden Hour™ Medic pack holds blood and other chilled medical supplies for two days in harsh conditions and up to three days in standard environments. 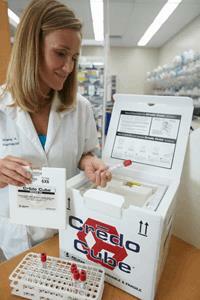 Reusable, iceless medical container has a removable TIC™ system that is easily conditioned in a freezer for year-round use. Designed to be carried by medics far forward from the Forward Surgical Teams (FSTs) for safe use of RBCs. Additional applications include safe transport or storage of vaccines, biomedical materials, reagents and other temperature-sensitive medical materials in the 1º to 10ºC and 2º to 8ºC ranges. The new Crēdo Series 4 PROMED temperature-controlled portable and reusable medical transporter line was designed specifically for the "always on the go" needs of pharmaceutical reps and first responders alike. Our range of single use passive bulk shipping solutions are suitable for all biopharma and clinical trial applications. 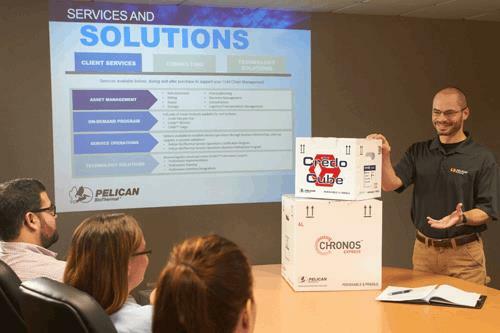 At the cornerstone of Pelican BioThermal’s reusable cold chain packaging solutions is the Crēdo™ Cube – a sustainable option that lessens an owner’s carbon footprint, reduces waste and decreases costs. Our products are designed for the demands of global temperature controlled logistics and are tough, durable, reliable and easy to use. Pelican BioThermal's high-performance, durable and reusable, passive temperature-controlled Crēdo Xtreme pallet shipper is offered in two sizes (half and full pallet) ideal for consolidating large domestic and international cargo shipments. Our range of single use and reusable parcel shipping solutions are suitable for all biopharma and clinical trial applications. Utilizing advanced insulation, together with either water or phase change material to give consistent results, our products achieve consistent temperature stability for your valuable payload. Our products are designed for the demands of global temperature controlled logistics and are tough, durable, reliable and easy to use. Pelican BioThermal Parcel Shipper Packing Shootout! Peli BioThermal, the global name in temperature controlled packaging, announces the opening of a new network station and service centre in Los Angeles to service, refurbish, repair and condition Peli BioThermal’s reusable Crēdo on Demand shippers. There are three technology trends that could help mitigate airfreight logistics risks, reduce costs related to transportation issues and/or temperature excursions, and deliver high-quality drugs safely. A shipping solution that maintains the temperature of a product in its journey to the patient, preserves the intent of the medication, the safety of the investment, and the lives of the patients who depend on them. Peli BioThermal, the global name in temperature controlled packaging, announced its global network continues to rapidly expand under the leadership of Dominic Hyde, vice president of Crēdo on Demand. Pelican BioThermal, the global name in temperature controlled packaging, announces that James Klingelhoefer has joined the company as director of sales, Americas. Cold chain for life sciences continues to undergo seismic change along with pressures to keep consumers costs down while increasing profits. Following are four predictions from a pharmaceutical packaging solutions company anticipating what will continue to drive change in 2019. Peli BioThermal, the global name in temperature controlled packaging, officially announced the appointment of Lynaye Reynolds as Worldwide Director of Quality for its BioThermal Division. Peli BioThermal, the global name in temperature controlled packaging, is celebrating the five year anniversary of Crēdo™ on Reserve, its long-term rental program for the cold chain pharmaceutical distribution industry. Peli BioThermal, the global name in temperature controlled packaging, has announced production of its newest addition to its range of bulk shippers, the CoolPall™ Flex, which is now available to purchase for the first time. Administration of blood in the pre-hospital environment is becoming more feasible for emergency helicopter and ground transport crews. Peli BioThermal Announces Second Successive Queen’s Award Win! Peli BioThermal, the global name in temperature controlled packaging, announces it has won the Queen's Award for Enterprise: International Trade 2018. Peli BioThermal, the global name in temperature controlled packaging, announces the addition of eight new drop points serving customers across the U.S. The drop points further the expansion of Peli BioThermal’s growing Crēdo™ on Demand rental program by providing additional points of return for reusable shipping assets. Pelican BioThermal, the global name in temperature controlled packaging, announces the addition of eight new drop points serving customers across the U.S.
Pelican BioThermal, the global name in temperature controlled packaging, is sponsoring a speaker track session featuring customer, Accuristix during IQPC’s 16th Annual Cold Chain GDP & Temperature Management Logistics Summit - Canada in Toronto. Pelican BioThermal, the global name in temperature controlled packaging, announces the February 15th grand opening of its first service center in southern California, located in San Diego. Pelican BioThermal, the global name in temperature controlled packaging, recently announces their founding membership in Poseidon. Poseidon is a sea freight model acknowledging and supporting the intimate interconnection of the entire pharma-logistics supply chain in order to better ensure the safe and secure transportation of health-giving and life-saving pharmaceutical products. Pelican BioThermal, the global name in temperature controlled packaging, is exhibiting its latest shipper systems and services at the 17th Annual Cool Chain Temperature Controlled Logistics conference.